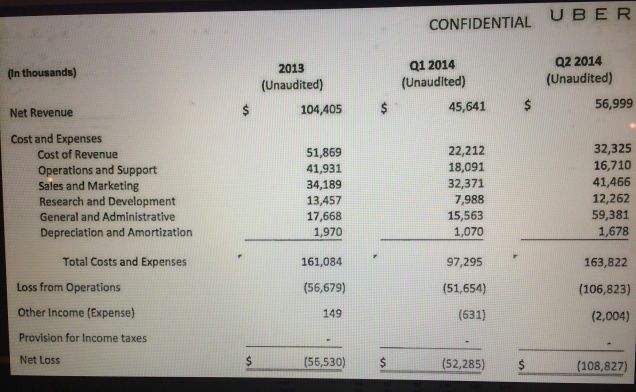 Gawker has got its hands on some internal Uber documents, apparently showing the company’s quarterly profit and loss over the past few years. It seems everyone’s favorite Silicon Valley Unicorn loses quite a bit of money. Another document, laying out quarterly profits and losses in 2012 and part of 2013, shows the same dynamic: healthy growth in revenue coupled with steady, deepening losses. In 2012, Uber’s losses totaled $20.4 million; from the first quarter of 2012 until mid-2013, quarterly losses more than doubled from $3.5 million to $8.1 million. The losses are explained as Uber paying drivers before reporting its net earnings. In that light, Uber is actually doing the right thing by drivers and investors. Uber’s losses also come as it rakes in venture funding and increases its valuation — at a historic rate. The company has also expanded aggressively across the globe, spreading thin before it grows. Like Amazon, Uber can become something we rely on day-to-day. Uber also loses lots of cash — just like Amazon. Uber’s backers (and Amazon’s investors) aren’t concerned because the two companies are playing chess, not checkers. When the services that Uber and similar companies provide become the mainstream way for people to navigate their daily lives, there will be profit. It’s delayed gratification in the instant satisfaction era, but the payoff — literally and figuratively — will be worth it.